You see, I studied French in high school and came to love the language and culture. During my college years, I had a single-minded quest to graduate as quickly as possible and start living my life. Study abroad never entered the picture. After I graduated from college, I immediately pursued a career in teaching. While working towards my master’s degree, I became enamored of the idea of working or living abroad. Since I was already proficient in French, I decided that France would be the ideal location for my initial international sojourn. While perusing a teacher’s magazine, I came across a study abroad in France opportunity that was too good to pass up. It was focused on French teachers and offered them a chance to study at the famous Sorbonne. I leapt at the opportunity, and the rest is history. I planned a marvelous summer. 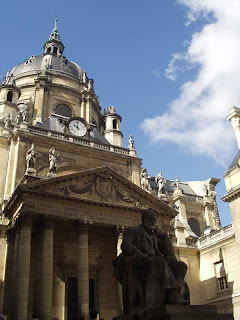 I would study at the Sorbonne during the mornings. My afternoons were totally free. I could plan whatever I wanted. I lived in the shadow of the Eiffel Tower in an apartment house with other French families. Life was indeed magnifique. I prepared for my total immersion by listening to audio files of French conversation during all of my waking hours. I even hooked up a continuous loop of French that would play repeatedly while I slept. I was determined to hit the ground running, and I did. I would recommend that all people who desire to study abroad put in the time learning as much of your host country language as possible. You can never know too much vocabulary. The grammar will come naturally as you converse with the natives. Get your hands on some French DVDs, movies, audio CDs. Take an online course. Do whatever you can to immerse yourself in hearing the language. Most people who experience the worse culture shock do so because they cannot adequately communicate with those around them. So, improving your conversational abilities will eliminate this stumbling block. My first days at the Sorbonne were hectic to say the least. My language facility was a bit inadequate when compared with those of native French speakers. I was fortunate to have a teachers cohort that I could easily slip back into the English language with. But I was also determined to live as much like a native as possible. The French families at the apartment house befriended me. I developed quite a friendship with the many French immigrants from Morocco, Tunisia, Ivory Coast, and Algeria. We had endless lunches and dinners at the sidewalk cafes. We mostly frequented the Latin Quarter, and relaxed on the most famous street in le quartier latin – le boulevard St Michel. I enjoyed stopping in and talking with the locals as I walked to and from classes. My friends took me to little inexpensive restaurants that I can still remember. I had the best couscous in my life and fell in love with Moroccan food. Even though the French subway system is among the easiest to navigate that I have ever seen, I really preferred to walk while I lived in Paris. There was so much to see and do. I remember walking to Nôtre Dame, strolling down le Champs Elysées, spending a lot of time at Hôtel des Invalides/Napoleon’s Tomb, visiting the tomb of the unknown soldier, and too much to describe here. Life was very spontaneous and very sweet. There were no cell phones in those days. But I had a bunch of French friends who would call me at all hours of the afternoon and evening. We had so many imprompu get-togethers. My room was on the second floor, facing an open courtyard. They would come to the first floor of the courtyard and call up to me. My name would resound throughout the courtyard. I still chuckle when I think about it today. The Sorbonne offered an excursion to a different province of France every weekend. We visited la Normandie (Rouen, Caen, Le Mont St Michel), la Bretagne (Rennes), Champagne (Troyes), Orleans (home of Joan d’Arc), les Chateaux de la Loire (Lyons), the castle of William the Conqueror (le Chateau de Guillaume-le-conquerant) in Falaise, Normandy, and many more treats. I saw many castles and was awed by the sound and light shows. To me, being able to live in France for an entire summer was a dream come true. Study abroad can be such a rewarding activity. If you have a chance to live abroad, even for a short summer, I say, “Go for it.” You’ll be glad you did. Angela Arnold conducts deeply personal and heart-felt interviews with lovers of study abroad and teach abroad. Mrs. Arnold is an author, consultant, and educator. In addition to her own deeply rewarding international studies, she is the parent of two children who had phenomenally successful study abroad and/or teach abroad experiences, and she is an exceptionally strong proponent of study abroad.